Reata specializes in upscale cowboy cuisine right in the heart of Downtown Fort Worth. Menu items have Southwestern influences and include a range of options that can delight everyone from a dedicated carnivore to those looking for lighter fare like seafood. The rib-eye will please the traditional steak lover, but don&apos;t overlook other favorites like the tortilla soup, tenderloin tamales and chicken chile rellenos. The menu at Hoffbrau&apos;s is a mix of Texas cuisine alongside homestyle classics. 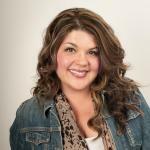 Menu includes a bacon-wrapped filet, Hoffbrau’s own signature steaks and chicken-fried steaks. Other Hoffbrau favorites include a Dr Pepper® BBQ Chicken and peach cobbler for dessert. The menu at Horseshoe Hill Cafe keeps it simple and features steaks and chicken-fried steaks. The dry aged rib-eye offered on the menu does not play second fiddle, it weighs in at a whopping 16 ounces and is expertly prepared. The deviled eggs are a great starter and the blue cheese coleslaw is a standout side dish. 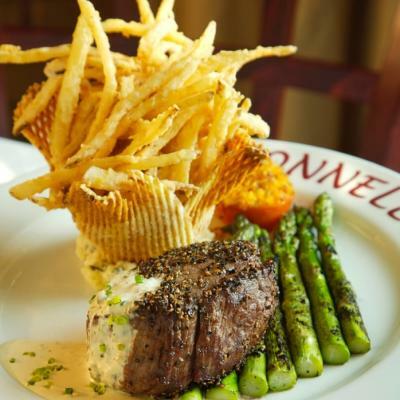 Bonnell&apos;s takes the steak out of the steakhouse and brings it into the realm of fine dining. Without approaching pretension, the cuisine at Bonnell&apos;s is both high-end and down home with a unique emphasis on game meats. Southwestern and Creole style dishes are elevated under the direction of Chef Jon Bonnell with offerings such as elk mini tacos, oysters texasfellars and Texas shrimp and grits. Steaks are organically sourced and accompanied by compound butter for extra flavor. Reminiscent of an upscale hunting lodge, Buffalo West provides a cozy atmosphere for your dining. The menu here takes familiar classics and dresses them up with chic ingredients for a tasty experience. Try the Buffalo West Sizzler, a 16 oz bone-in rib-eye served on a cast iron skillet and topped with onions, bell peppers, mushrooms and jalapeño. You will also find other favorites included blackened chicken tacos. Get a Texas-shaped Belgian waffle with praline pecan ice cream for dessert. For a true Cowtown experience head on over to the Stockyards and grab a saddle seat at H3 Ranch. Yes, they have horse saddles for stools that kids will get a kick out of. The steakhouse serves up wood-fired steaks that aren&apos;t to be missed in a fun western atmosphere. Bring an appetite so you can start off your meal with some guacamole made tableside. Ribs are another popular choice. Round out your meal with one of their delicious sides like roasted corn or a baked potato. Lucille&apos;s diverse menu offerings make it a great go-to spot when you are looking for more than just a great steak. Choose from a filet, rib-eye or sirloin for steak options. Other favorites come from their wood-fired oven like the wood roasted chicken or their personalized pizzas and flatbreads. Soups like their lobster bisque and cioppino are popular selections. Kids can choose from burgers, grilled cheese and chicken tenders. Watch the cook sear your steak over an open fire in the dining room at Cattlemen’s Steak House. The Texas T-Bone Steak is guaranteed to satisfy the heartiest of appetites. Beef steaks and rib-eyes dominate the menu but you will also find lobster, crab and shrimp on the menu. All of their steaks are charcoal-broiled and they never use a tenderizer. Try to save room for the best banana pudding for dessert. While your anniversary or date night meal may be celebrated at Del Frisco’s Double Eagle Steakhouse, its counterpart Del Frisco’s Grille makes it easy to enjoy a four-star meal with the whole family in a trendy, yet comfortable atmosphere. You will find many of the favorite staples found on the Del Frisco’s menu, as well as some new delights (the brussel sprouts are out of sight). 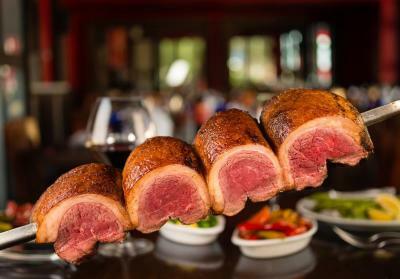 When you combine the cuisine of Southern Brazil with the spirit of Texas you get Texas de Brazil. The salad area includes appetizers, vegetables, soups and salads. Entree dining is modeled after the Brazilian “Churrascaria,” or steakhouse, where carvers come to your table to offer you various cuts of seasoned beef, lamb, pork, chicken and Brazilian sausage. The traditional Brazilian cheese bread is a favorite accompaniment. In the heart of the Stockyards, you will find Riscky’s Steakhouse. The restaurant has been serving guests since the 1920’s. Ranchers, cattlemen and cowboys have all walked through those doors to enjoy a steak. The Flat Iron Steak is a house favorite and the Calf Fries are world famous. You will also find escargot and Texas pecan crusted Tilapia on the menu. The pecan pie has a cream cheese filling and you can add a scoop of Blue Bell ice cream. Don’t let the BBQ in the name fool you, Cooper&apos;s serves both sirloin and a rib-eye steak. Cooper&apos;s is casual dining in a large main dining area as well as a patio with a view of the Fort Worth skyline. Here the sirloin is served by the pound and rib-eyes are available Friday and Saturday after 5 p.m. Sides are served a la carte or as part of the daily specials. Desserts include four different kinds of cobbler. Entry partially written by Josie Villa Singleton.